We would have remembered the name of the soprano singer, and probably shed a tear or two when she reached the unnaturally high octave during the moving scene of bidding farewell to her dying lover. But high chance is, we wouldn’t have noticed that cellist seated beneath the stage, who struck the most perfect melody during the entire 3 hours of the opera session. You might have felt your heart throbbing in excitement when the graceful ballerina did the most stunning Grand Jete split in the air, and would have given those amazing dancers a standing ovation by the end of the extraordinary show. But huge chance is, you wouldn’t have taken a careful glance at the flutist that blew the most emotional piece of music accompanying the touching pirouette during the ballet performance. They are the invisible hands, the out-of-view musicians that produce the loveliest renditions for the Australian Ballet, Opera Australia, Victorian Opera and The Production Company. 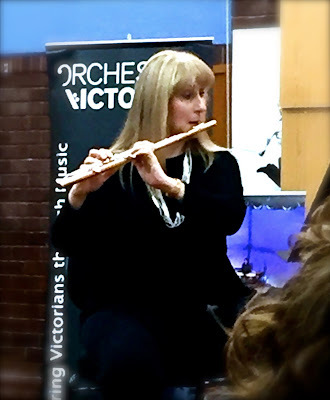 First established in year 1969, the Orchestra Victoria has come a long way, having changed its name thrice, and has its ownership transferred from one entity to another before settling down as a wholly owned subsidiary of the Australian Ballet in 2014. The orchestra has had its fair share of financial crisis (an unsurprising phenomenon besieging many artistic organizations in the world). The orchestra was nearly at the stage of insolvency just few years back. After all, it is an expensive project to fund the operational costs of a successful music body: a few million dollars per year is the bare minimum costs to keep an orchestra up and running. To supply reed and maintain a clarinet, a total of $68 per month is needed; a music stand costs $210 per piece, and a pair of custom-made moulded earplugs costs a staggering price of $380. “Five at 5” is a series of five concerts with free admission held on five Saturdays at 5pm throughout 2016. We attended the third session recently on 23 April 2016. It was a beautiful one-hour performance with a rare focus on the woodwind instruments. The flute, oboe, cor anglais (English horn), clarinet and bassoon belong to one of the humblest instrument families in an orchestra. Unlike the string instruments, the woodwind family would have to put up quite a struggle to create similar flamboyant and intensive range of tones as the violin. They are never the loudest, highest sounding, or the most prominent instruments in the musical family. The harmonies produced by the woodwind family are soothing and pacifying. We listened attentively to the warm conversations between two calming baritones from the bassoons, started with the joyous and positive Allegro by Francisco Mignone, followed by his equally playful and rapid duet of Rondo-Chorinho with a sudden change of mood in the mid. 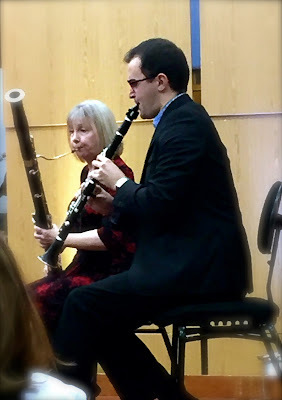 The deep and mellow dialogues of the two clarinets in the Sonata by Francis Poulenc were mesmerizing; the first movement of Presto was mysterious, the second movement of Andante was hypnotic but somewhat gloomy, and the last movement of Vif brought unexpected agility to the somber atmosphere. The Ecstatic Dances for Two Flutes was a long conversation between two nocturnal animals in the quiet forest, telling their life stories in the darkness. The compositions by Eugene Bozza are a harmonious choir of flute, oboe, clarinet and bassoon. The audience was brought into a roller coaster of emotions: from slow and moody, dynamic and fun, to solemn and blue. The woodwind concert performed by the Orchestra Victoria was an enthralling musical experience, alluring and reaching to the deepest of feelings.